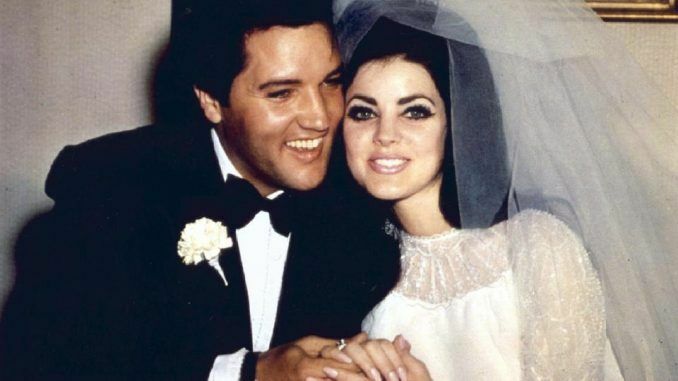 On May 1, 1967, after nearly eight years of courtship, Elvis Presley married his sweetheart Priscilla Presley (nee Beaulieu) in Las Vegas. 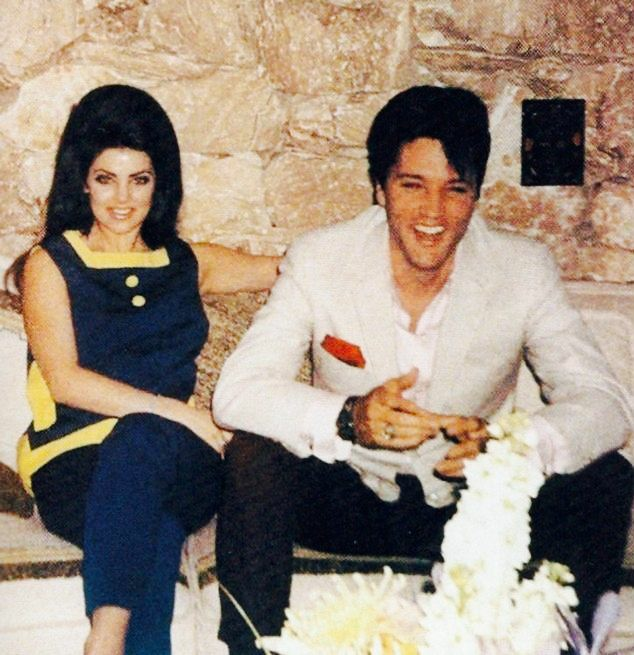 After the wedding, the couple wasted no time in flying to California, where Elvis had already leased a custom-built house in Palm Springs. 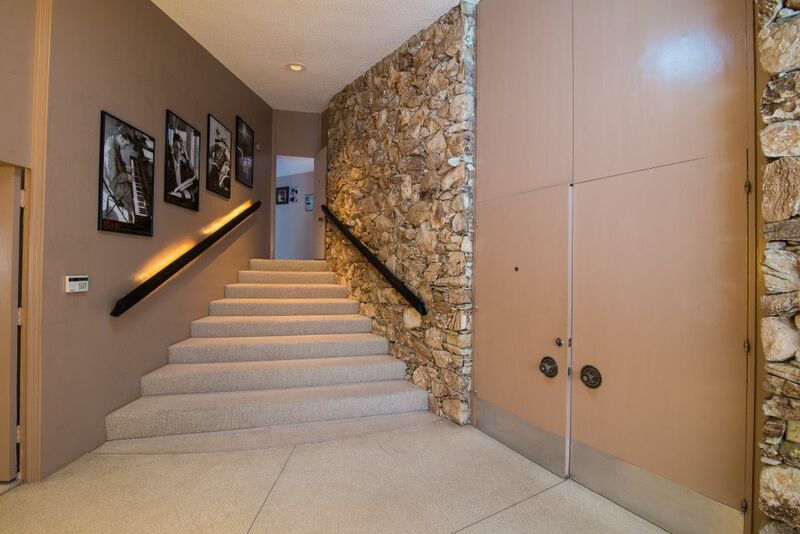 According to Rolling Stones, the King of Rock 'n Roll carried his virgin bride up the stairs of the mid-century home while singing "Hawaiian Wedding Song" from his 1961 film Blue Hawaii. The newlyweds lived at the house, which is now known as the Honeymoon Hideaway, for a year before moving out. 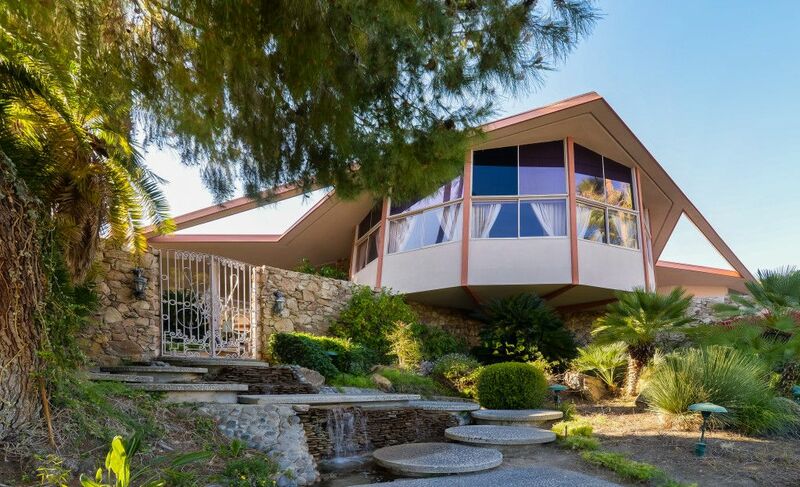 The 5,000-square-foot house, which was designed by modernist architect William Krisel and built in 1962, has four bedrooms, five bathrooms, a tennis court, an in-ground pool, and a large garden. It also features some unique custom stonework, huge glass windows, and currently has Elvis memorabilia throughout. 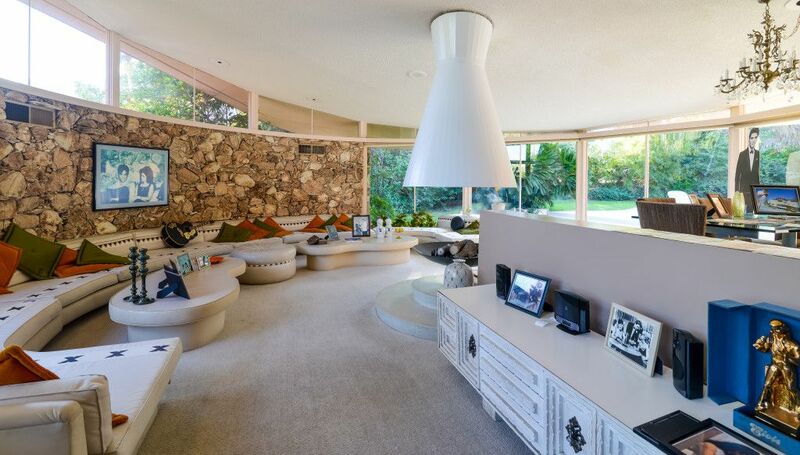 The design of the house was way ahead of its time and that earned it the nickname "House of Tomorrow" from Look magazine. The builder, Robert Alexander, and his wife lived at the house until they both died in a plane crash in 1965. Two years later, Elvis paid $21,000 to rent it for a year. The modular home has been on the market a few times since Elvis and Priscilla moved. In 2014, it was listed for a whopping $9.5 million, but it has since been reduced to $5.9 million. It was once again put up for sale in 2017. The main focus of the open concept living room is the stonework on the curved wall behind the 64-foot sectional sofa. 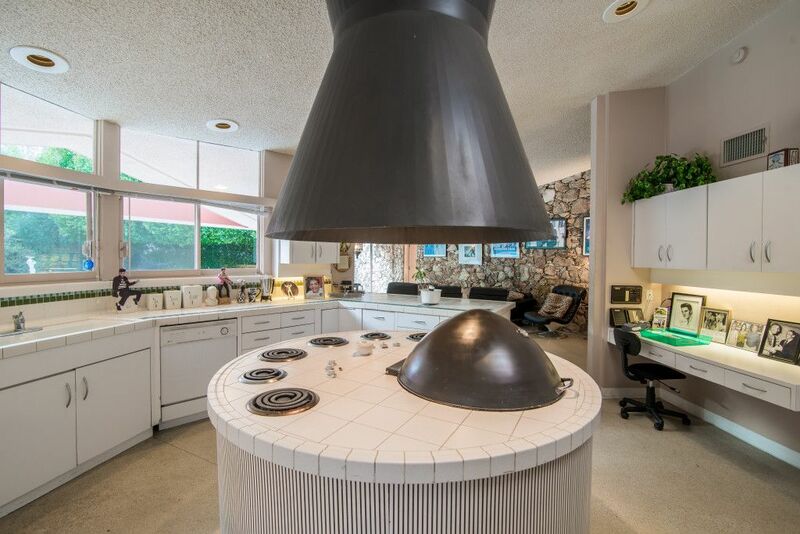 However, the unusual circular fireplace in the middle of the room is also noteworthy. The dining area is located within the living room and expansive the floor-to-ceiling windows not only bring in natural light, they offer a clear view of the lush backyard. 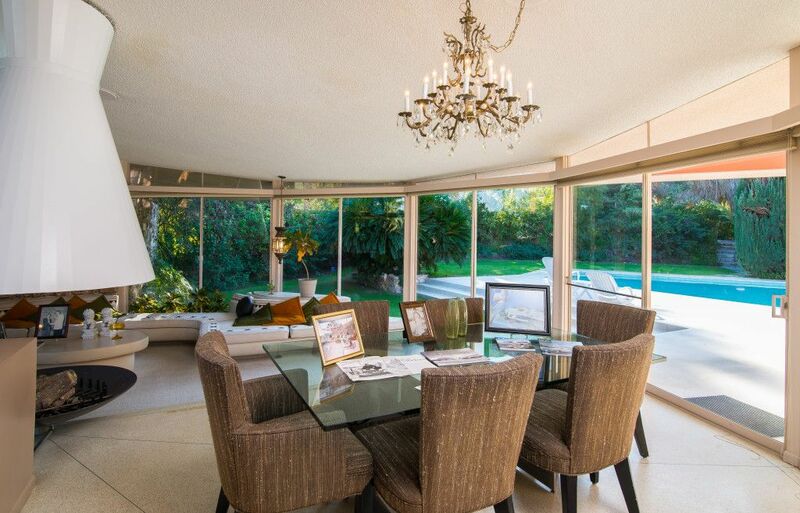 Original details like the chandelier above the dining table are still intact. Honeymoon Hideaway has four living areas, all of which feature the same stone wall. 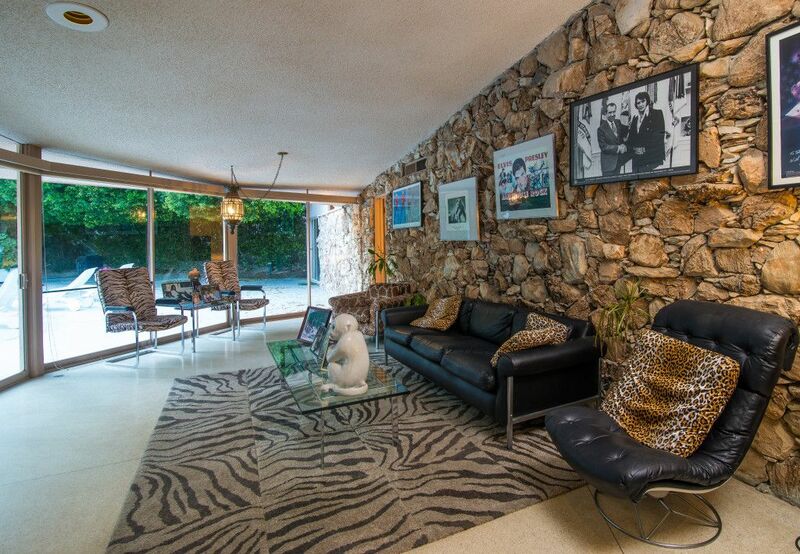 Like the "Jungle" room in Graceland, this particular room's theme boasts a lot of animal print and some plants to reflect Elvis' love for nature. This living room is located right off the kitchen. 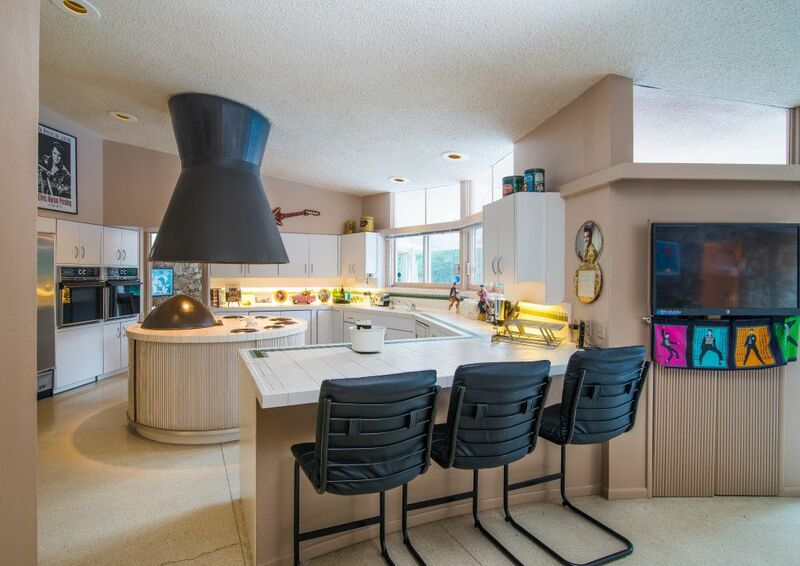 The all-white cabinets and counter tops emphasize the home's 60s vibe, but the true star of the chef's kitchen is the circular island in the middle. 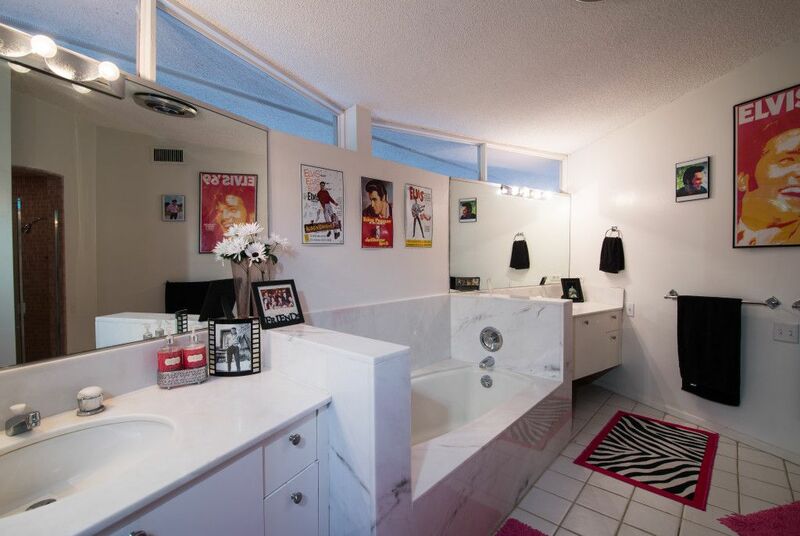 More recently, they've added photos and one of Elvis' guitars on the walls of the kitchen. The kitchen also has a bar area which backs into the sunroom. The circular house has been turned into a museum of sorts, and its owners even offer daily guided tours. The walls of the rooms and hallways are all lined with the late singer's memorabilia. Two TV movies, Elvis & Me (1988) and Elvis by the Presleys (2005), were filmed at this house. The upper levels of the three story property are no different than the bottom floors when it comes to the circular theme. 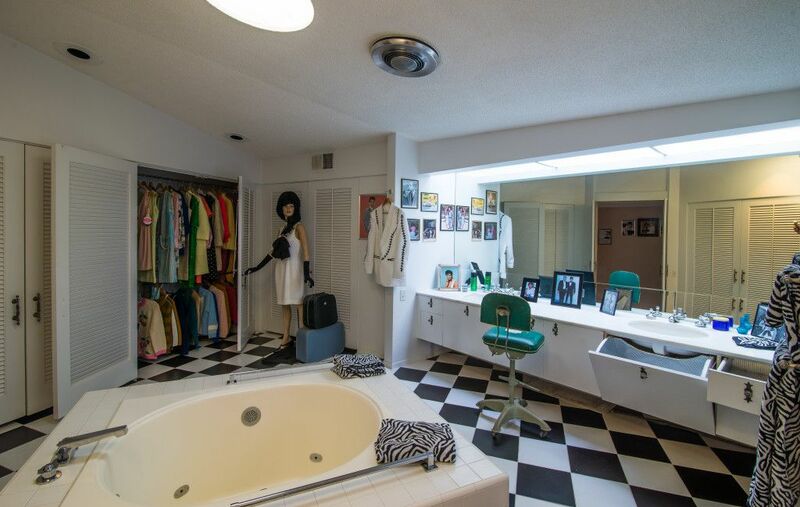 The master bathroom features a large Jacuzzi tub, a closet, and dressing area. The second of five bathrooms appears simpler with a tub propped between two sinks. 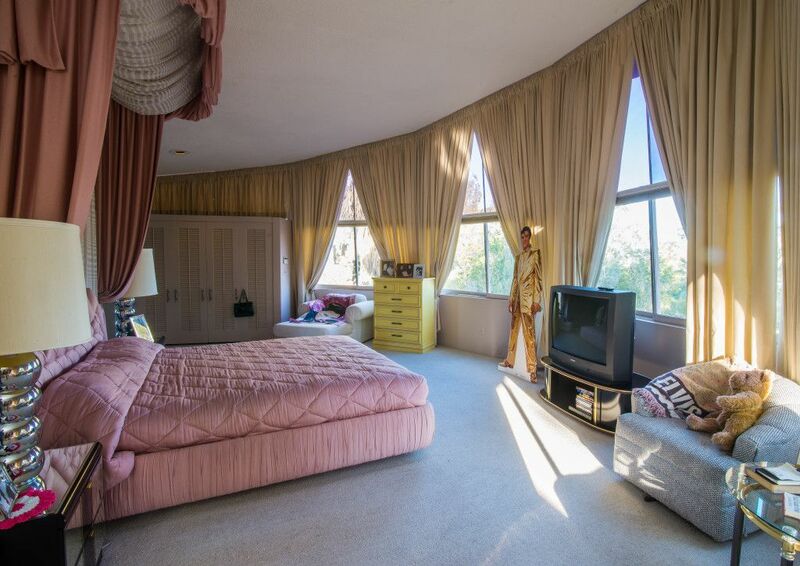 The master bedroom, featuring a plush pink bed, is surrounded by glass walls that overlook the grounds. It is believed that this is where the "Jailhouse Rock" singer and his bride consummated their marriage. 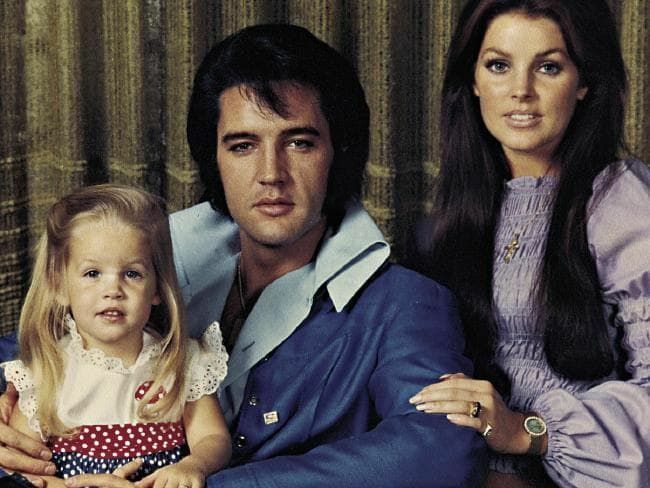 Exactly one year later, on February 1, 1968, their daughter, Lisa Marie, was born. 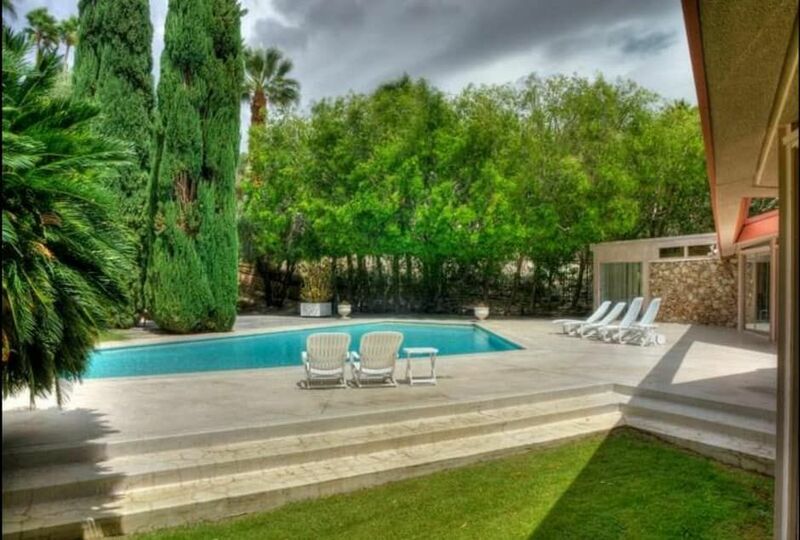 The back of the house, which is beside Marilyn Monroe's desert retreat, boasts a pool, gardens, and a fruit orchard. 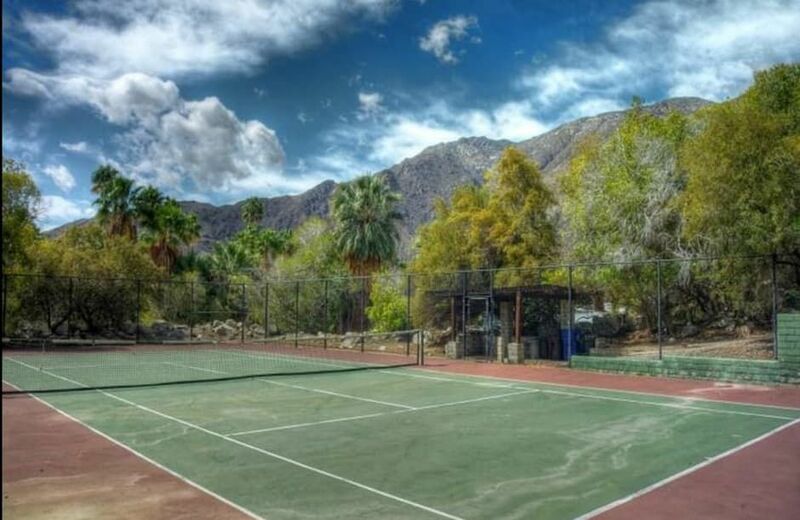 The Santa Rosa mountains and the Coachella Valley can be seen from the private tennis court. 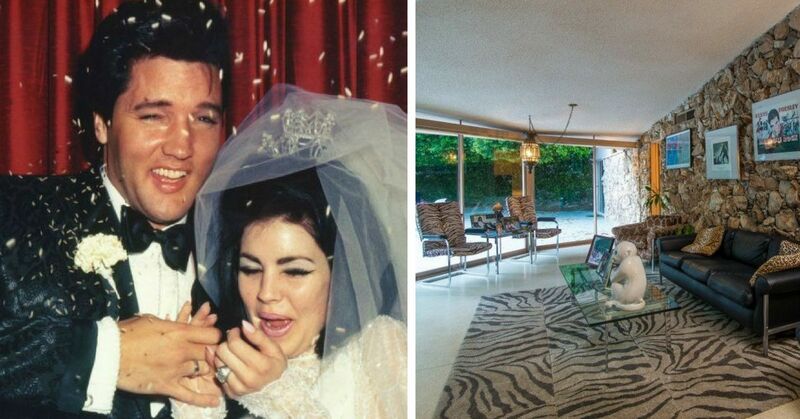 While this house gives us a glimpse into the glamorous life Elvis and Priscilla were living even before relocating back to Graceland, the years that followed the honeymoon phase weren't all rainbows and butterflies. 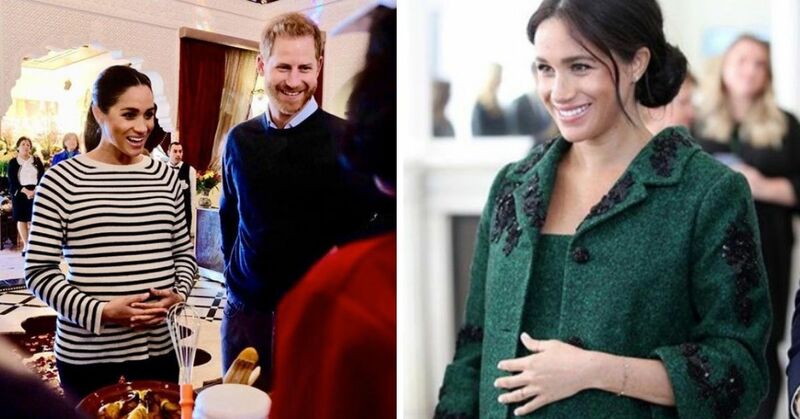 In 2017, Priscilla made headlines when she appeared on the British television show Loose Women and revealed that she felt uncomfortable during her marriage to the celebrated singer. 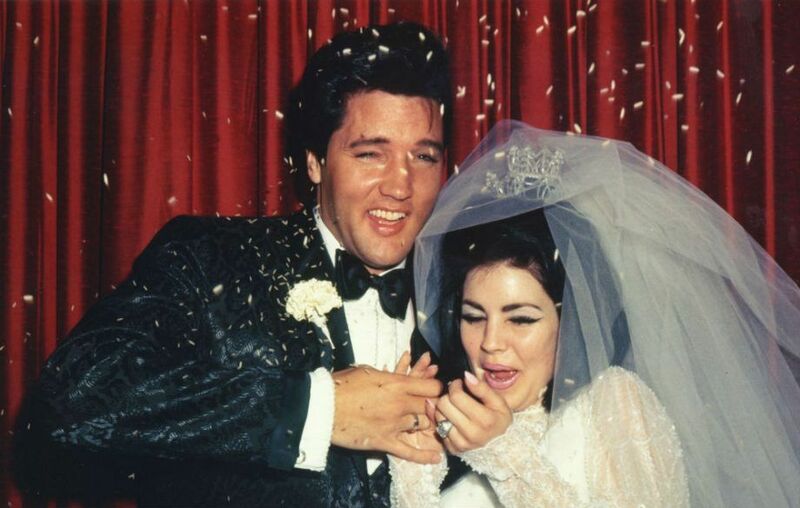 Priscilla, who was was only 14 years old when she met the "Heartbreak Hotel" singer, admitted that she did not get to enjoy her youth, and it took a divorce for her to finally realize how much control Elvis had over her life. 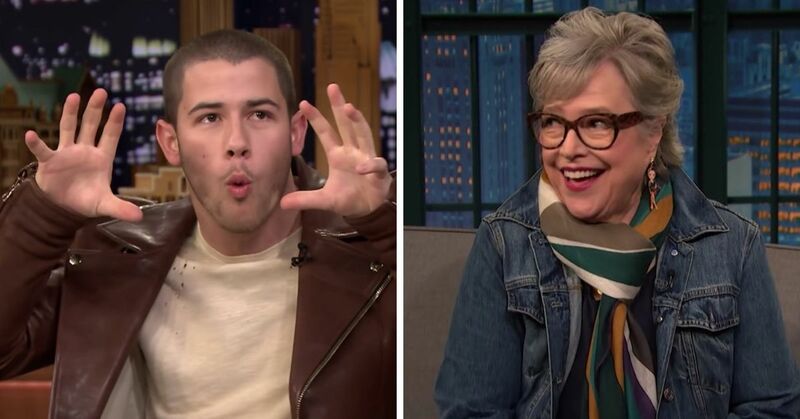 She told the hosts that she was living "his [Elvis] life, seeing the movies he wanted to see, listening to the music he liked, and going to the places he wanted to visit." The singer and actress explained that she did not have her own identity while living with the star at Graceland. After six years of marriage, Priscilla left the music icon because she "needed to find out what the world was like" without Elvis. In another interview while on The Jonathan Ross show she said their split was "difficult" because "Elvis did get a little bit lost and basically he felt he was getting older. He had a lot of issues that he was dealing with, he became more isolated and it was difficult, yes." 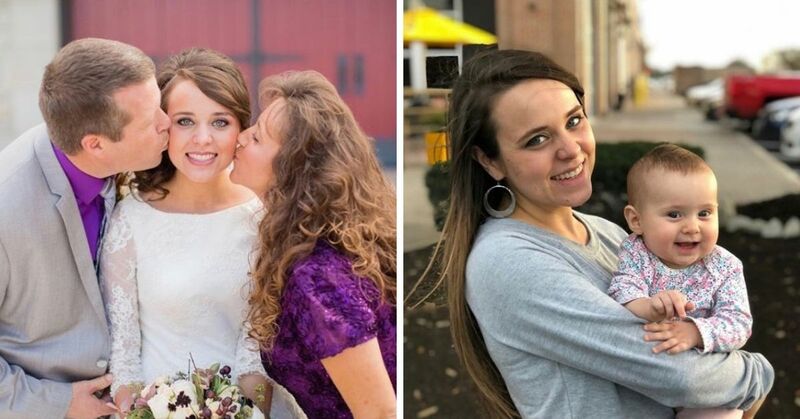 If it's any consolation, their break-up was mutual and the pair even showed up to the court house holding hands. Priscilla has never remarried, but she was previously in a relationship with American businessman Marco Garibaldi for 22 years. They have one child together, a son named Navarone, who was born in 1987. Even after a short and complicated marriage, Priscilla and Elvis remained close and even today, she plays a role in continuing his legacy. 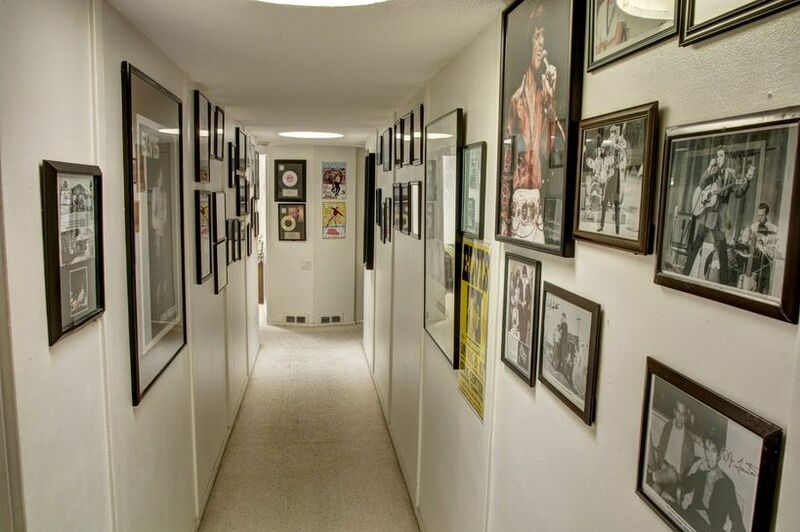 You can also Take A Look Inside Elvis Presley's Graceland Estate.